I expect a very orchidful house this year. Several weeks ago the temperature dropped unseasonally. Although the temperature returns to normal, my orchids already got the signal – it’s time to send out some spikes. It’s going to be a month or even two before some of them become flowers. 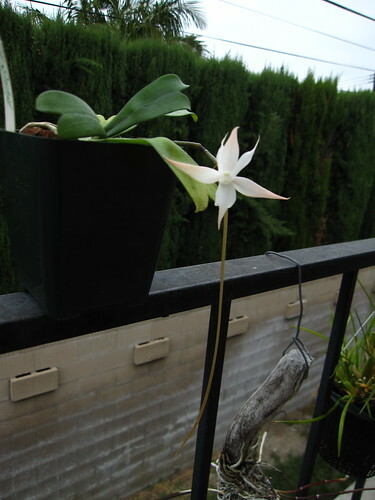 In the meantime, I do have a small blooming orchid that’s worth some mention. This little guy sent out a spike 3, 4 months ago, and yes, that’s how long it takes for the flower to fully develop. This is another orchid species, Aerangis splendida. Although this year the plant decides to only give me one flower out of the spike, but I still appreciate it. I am guessing next year it will be better. I know it has potential (Aerangis splendida can produce as many as 5 or 6 flowers on one spike). As with many other white orchids, Aerangis splendida is fragrant at night. To give you some sense of scale, that spur is about 6 inches long. The cool thing is that I can see about half of it is filled with nectar. Seeing the pollinator trying to get to the nectar would be an amazing scene. Unfortunately, the suitor is in Africa, thousands miles away from my home.